Network security controls serve to protect the underlying networking infrastructure from unauthorized access, malfunction, exploitation, misuse ..etc. Creating a secure networking environment guarantees the authenticity of network traffic while maintaining both software and hardware technologies. Implementing and managing network security are two very important processes that need to be large in scale and therefore include all the defensive networking layers. In other words: each networking layer should have its own specific security policies and controls. To connect to any part of a certain network, authorized users should go through an authentication procedure as a preventative measure to block and contain malicious traffic. Following through the newest network security updates is fundamental for organizations to maintain the necessary level of security across their infrastructure. Staying up to date with security trends and having a good understanding of modern threats facing networks is very important to the overall security posture. However, thorough control of any is often difficult to be achieved and it is therefore better for organizations to focus their resources on bigger threats and prioritize their operations. Security helps networks to survive in an internet full of threats and as a result secure networks will create a safer internet. Implementing Antivirus and Antimalware Software Where Necessary: This type of software is the main defensive measure against common malware variants such as ransomware, spyware, worms, viruses, and trojans, and advanced persistent threats. What makes malware one of the fundamental threats to networks is their ability to spread across all the network devices in no time giver the right environment. Networks need to contain antimalware software across all devices for the regular detection of threats and proactive removal. Data Loss Prevention: The most valuable asset within a network is the data held within its connected devices. It is a number one priority for network administrators and security engineers to detect and prevent any confidential data from being leaked out of any device due to any internal or external factor. Data may be physically or logically removed from the organization either intentionally or unintentionally. Firewalls​: Firewalls are often referred to as the first defensive layer for networks against outsider threats. The internet holds a cluster of both healthy and defective traffic and it is quite the priority to filter your traffic if you want to protect your network. You can do so by creating policies and firewall rules that would permit or block traffic depending on what you deem to be malicious. Virtual Private Networks​: Connecting from a device to a network can leave your packets vulnerable to interception or sniffing. To avoid such scenarios, it is recommended to implement a virtual private network to add a layer of security. Big scale cyber attacks often start small by infecting a lower-end device and then escalating privileges to go further within the same network. To better secure a network it is necessary to see matters from the attacker’s point of view and think of how to find a way in given the information that is available to the public. Attackers are most likely going to carry out their initial attacks using traditional methods. Think of them like trial attacks to test the waters. As a first step an attacker will probably send a malicious attachment over the email targeting the human element or trying out automated exploits. If the users within the target network lack the fundamental or often times the necessary security knowledge they might fall into these attacks because of the fear of missing out (fomo). Fomo is a human factor that is often exploited by strategic attackers. They would tailor this irresistible offer from a “big firm” in the form of a plausible email with downloadable attachments or clickable links. Employees who were not made aware of social engineering will often fall victim to this because they do not want their organization to miss out on this offer. Wireless attacks can also be an entry point for attackers and they can be carried out in a variety of forms. Attackers can compromise their target WIFI networks through known vulnerabilities within the right range of the network. Intrusion Prevention Systems (IPS) that consist of multiple security layers will be the best option to defend against this type of attacks. Spoofing (Identity or IP Address): Using this technique, the attacker manipulates IP datagrams and tries to modify the IP address’ header layer along with the packets that carry the information form the attacking device. If this goes successful, the attacker will gain a level of anonymity that would help cover their tracks and often help establish credibility in the right scenario. Man-in-the-middle attacks (MITM): In computer security, a man-in-the-middle attack is considered as an attempt to hijack the communication between two parties within a network on the level of TCP/IP protocols. The hijacker monitors and controls the communication by rerouting data to a device of their choice. The main motivation of this technique will be to deceive target by making them think that the data they are receiving is being sent from a certain plausible source. Trojans Attacks: Trojans are a type of malware that disguises itself as a valid piece of software. When they are executed om a target device they usually enact a list of harmful processes that would compromise it, monitor it, control it in real time, and often times mirror the attack to other devices within the network. Sniffing: In the context of network security, packet sniffing is the type of attacks that allows the attacker to intercept data as it circulates through and within a network. Capturing the travelling data is often carried out by executing sniffing software on any layer of the network. if the sniffer is positioned in an aggregation point of a network, the whole traffic will be monitored. Distributed/Denial-of-Service (DDoS/DoS): DDoS attacks are damaging in nature and they are not typically motivated by monetary incentives. This type of attacks floods the target network with traffic to occupy all of its resources and make it go down. When all the physical network components and all the bandwidth is consumed by fake requests, the real request will be futile. Pharming: This cyber attack redirects a network’s traffic to a forged website that is made to look like a legitimate one. Pharming can be conducted either by changing the hosts file on a victim’s computer or by exploiting a vulnerability in the DNS server software. Social Engineering: For attackers, social engineering is a way of non-technical deception they use in order to gain access to their target assets. Attackers here usually rely on users’ interactions by deceiving them to jump on what they have to offer and ignore standard security practices. The attacker pretends to be an authorized person coming forward with an offer or warning them about non-existing threats. This will often lead the victims to some engineered traps that may install backdoors on their network. Locate applications and other IT resources and their processes: Document and analyze your entire IT infrastructure and identify which information can be at risk during incidents that can cause privacy issues. Get a perspective of your network from the outside: ​Taking a look at your network from the outside as an unwanted guest or an authorized administrator will make you more accustomed to your network and give you at least a perspective of how attackers can plan and carry out an attack on your network. Scan your network for open ports, vulnerabilities, and outdated services: ​Perform regular/periodic scans that are both intensive and exhaustive in nature. The purpose of these scans will be to detect open ports, the services that run on them, and get an insight on what vulnerabilities can be exploited to gain access and carry out the patching process accordingly. 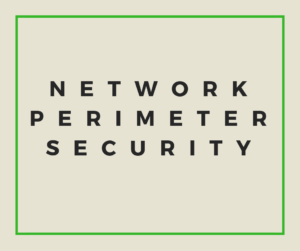 Track the capabilities and limits of your network security measures and protocols: ​Almost all private business networks come equipped with default firewalls and detection systems. However, only relying on these security measures will not be enough to pinpoint all potential threat. Understanding what your network gear and software is capable of and what are its limitations will make you in the loop on where to allocate your resources. You also need to have tabletop exercises to measure the effectiveness of your security measures. Inspect your internal network for insider threats and deficiencies: ​Insider threats are as dangerous and common as outside threats so it is mandatory to not prioritize a type over the other. Insiders can be malicious intentionally or unintentionally and therefore you need to enforce proper measures to contain inside threats. Review your wireless technologies, Wi-Fi, Bluetooth, RFID..etc: ​Wireless technologies and removable media come with their own security risks and vulnerabilities. For every new gadget or technology you decide to add to your environment you need to understand that they increase your level of risk around your organization and devise your policies subsequently. Educate users about social engineering attacks and assess their awareness: Humans are the weakest security link and they will continue to be so if they are not educated about the risks they present if they don’t comply with security best practices. Their security awareness should be put to the test on the regular to make sure they are always on alert. Use encryption on all your network access points: Encrypting network access points should be the first step to be taken. Attackers can easily take down your systems if they find a network access point that is not encrypted. If your router has a web management interface you should disable remote network access to it and change all default credentials. Protect all your devices with security software: Without some type of antimalware technology running on your servers and endpoint devices you are putting your whole network at risk and minimizing your chances of detecting persistent threats. Pay close attention to your servers as they are the devices that receive, send, and process data on the regular. Implement antiviruses, firewalls, and intrusion detection systems wherever necessary. Perform third party penetration tests on the regular: Third party penetration tests work wonders and they will give you a thorough idea of how your network security holds up to real attacks. These tests will usually come with a list of remediation tasks you need to do to step up your security practices. Use VPN for remote access: Some business operations will require remote access to your network which will present a major threat to your overall security. To manage these interactions securely it is better to have them carried out through virtual private network technologies. Update all software and Firmware: Make sure to always be on the loop when it comes to your software/hardware vendors’ updates and their newest releases. Whether it is router firmware or your antivirus technologies, you should check your vendors’ websites occasionally to make sure that your assets are running the latest firmware and versions.